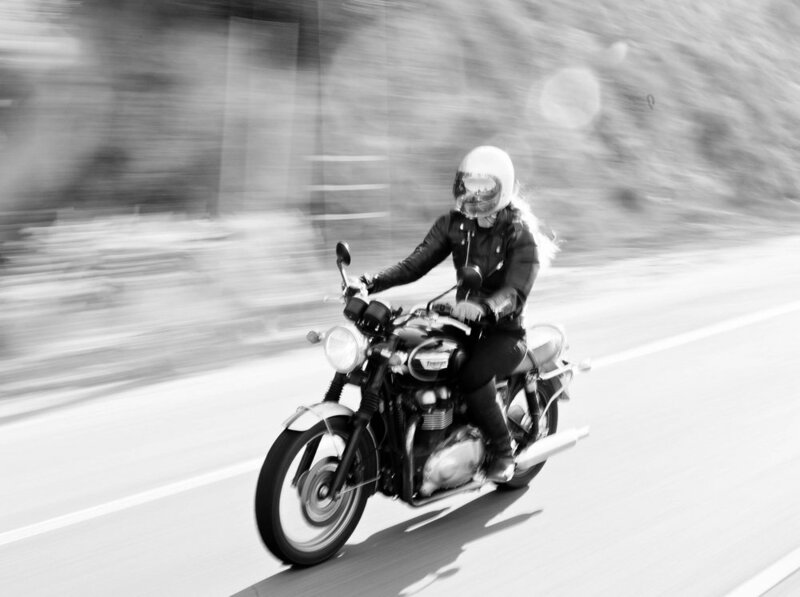 When did you first ride a motorcycle? I would ride around on little bikes and ATVs on a farm I used to work at in Ohio. My dad had a bike when I was growing up and he would always take me on the back of it. I think that’s where I really fell in love with the idea of having a bike. Scroll down to read the interview and watch The Gnar Gnar Honeys video profile ‘Ride Out’. "It’s life at hyper speed." "You omit the box and suddenly smell everything, hear everything and notice a whole heck of a lot more." What does it feel like to ride? I saw this one sign, and I’m sure you’ll relate to this, that said ‘only a surfer knows the feeling’ - it’s kind of like that. Inexplicable. I'm a romantic at heart, what can I say? Robert M. Pirsig did a pretty good job explaining motorcycling in his book ‘Zen and the Art of Motorcycle Maintenance.’ Within the first few pages he states, “In a car you're always in a compartment, and because you're used to it you don't realize that through that car window everything you see is just more TV. You're a passive observer and it is all moving by you boringly in a frame. On a cycle the frame is gone. You're completely in contact with it all. You're in the scene, not just watching it anymore, and the sense of presence is overwhelming.” I don’t think I’ve had that feeling go away, especially when I’m *in* it all, you know? What have been the biggest barrier’s to overcome in your riding journey? I didn’t have too many fears when I got on the bike. It’s like another appendage, I really feel natural on it. Sure, at the beginning I took my turns real slow and didn’t know if I could shift gears efficiently. But that nervousness went away with experience. I think that’s probably the barrier to entry to most things right? Being okay with being a beginner. Tell us about this bike you’re currently riding? It’s a 2014 Triumph Bonneville T100 SE. It’s a little larger, which is great since I’m really tall. It’s not the best for really long road trips, but day trips and for being an around city bike, you’d be really happy with this guy. I used to have a vintage Honda bike when I first started riding, but it was a lesson learned. When you’re first starting out, you just want a bike that works. I ended up selling that one and purchasing this one. Its been a lot of places with me but I definitely need to put more miles on it! "No one is going to look great when they’re starting something. Might as well do that new thing earnestly."